A trip to the National Gallery ends inevitably in the shop. One can buy a Van Gogh doll which now comes with detachable ear. Ho hum. Decided to take the family to Madame Tussauds this weekend and to avoid the queue, as their web site stated, we bought online. Needless to say we still had to queue for a security bag search, even those without bags. We then had to queue behind people who were buying tickets. Any attempt to ask for an explanation were stonewalled by it's the system, things were not helped when I asked if the organ grinder was available. In the end it was quite fun, better than when I was young as the models are now scattered throughout rather than behind ropes although the emphasis is now on ephemeral celebrities as opposed to historical figures. The live Chamber of Horrors was very scary with live models, to cap it all the fun ride near the end broke down and we had to be escorted out. The planetarium has now been dumbed down to a cartoon about celebrities, very sad. Out with some friends from work, as you do, when we notice that one looks like a performer from the old Black and White Minstrels Show. Turns out he's been putting his hand on the wall which has a row of candles burning next to it most of the time and is now covered in soot. Caught my usual train to London earlier this week. It was due to leave at 17:47 but was showing as ten minutes late when I arrived. At about 17:55 two ladies rushed down the stairs to the platform, saw that they hadn't missed it and collapsed onto one of the benches still out of breath. A couple of minutes later it was announced that it would be delayed by another five minutes, you should have heard them moaning! Very unreliable was the phrase that stood out, there's no pleasing some people. This shouldn't really be a funny story, but as no one got hurt it is. An Australian man was recently fined about £360 for driving with a five year old in his vehicle who wasn't wearing a seat belt. His priorities became obvious when the police discovered the crate of beer he had just bought was securely strapped in. Apparently he didn't seem to see the problem. The Times has the full story. On the escalator between the Bakerloo line and the main line at Paddington Station they replaced the static adverts with video screens about a year ago. I was coming home a few days ago and I saw what I first though was an advert for Windows, a bit odd I thought as it was for XP. 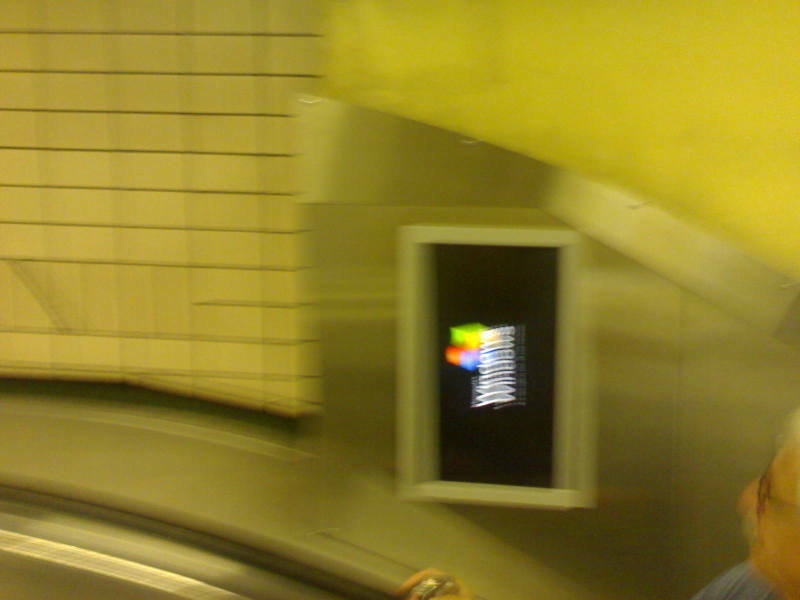 On closer inspection it was actually coming from the operating system, the It is now safe to turn off your computer message that you used to get occasionally with XP and Windows 2000. The picture below is not great, taken on my phone from a few feet away. We've just had the May Day public holiday, the weather was good, not blazing sunshine but sunny and warm, no sign of rain. Today is sunny too but the best indicator is here in my office, the heating, which has been sporadic at best over the last few weeks, is now on full blast. So Microsoft has given up its pursuit of Yahoo. I think I may have played my part. At the MVP Summit last month Steve Ballmer did a quick survey on who used which search engine. On being asked who used Google the majority of listeners raised their hand, very few admitted to using Microsoft's Live Search. When asked about Yahoo you could count the number of users on one hand. Ballmer cried out - We just offered thirty bucks a share for them! - much to the merriment of the MVPS. I have a sneaking suspicion the Yahoo board, or at least the shareholders are going to regret not accepting the offer, the company appears to be going nowhere, let's see in a couple of years.